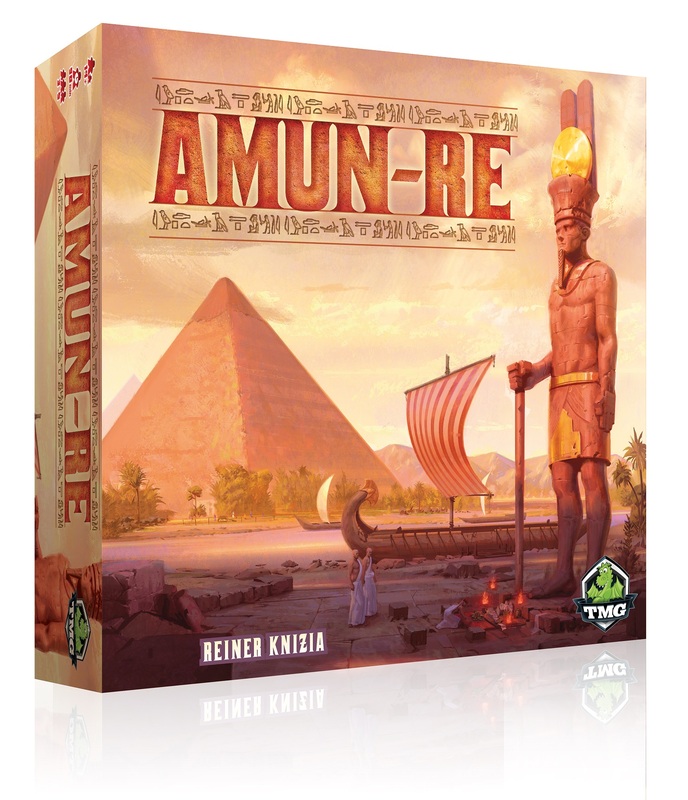 Amun- Re is a game by Reiner Knizia, published by Tasty Minstrel Games. It is for 3-5 players. In this game, players take on the role of Egyptian royalty. They will be trying to acquire new provinces through auction as well as build pyramids and develop cultures through the Old and New Kingdoms. In the end, the player that can gain the most victory points will be crowned the Pharaoh as well as being declared the winner. To begin, the board should be placed in the middle of the play area. The deck of Province cards and the deck of Favor cards should be shuffled separately. Depending on the number of players, a certain number of Province cards will be returned to the box without revealing them. Each deck is then placed faced down on the board. The farmers should be placed on their spot on the board, as should the stones, pyramids and double pyramids. The 4 Offering tiles should be placed face up next to the board. The gold cards should be separated by value with each one being placed in a stack face up beside the board to form the Gold Reserve. Each player chooses a color and is given 3 scribe pawns and a scoring cube in their chosen color. The scoring cube is placed beside the score track on the board. They will also receive 20 gold value worth of cards (1 one, 2 twos, 1 five and 1 ten), as well as a theft card and an architect’s favor card. The first player is randomly determined and is given the Start Player token. Play now begins. The game is played over two ages, the Old Kingdom and the New Kingdom. Each age is divided into 3 rounds with scoring at the end of each age. Each round is divided into 4 phases; auctioning provinces, purchase and construction, offerings to Amun-Re and harvest and income. The first phase is the auctioning provinces phase. In this phase, a number of province cards are drawn equal to the number of players and placed on the board in the corresponding province. Any stones, favor cards or gold shown in the Immediate Bonuses box of the province are placed on the province. Players in turn order will then place one of their scribe pawns on an unoccupied bidding space on one of the province cards. When placing a scribe, they may also place a protection card to block the next highest space on the card with their scribe on it. This will make it where another player would have to bid two spaces higher for a province. Once it’s a player’s turn again, they may either pass if their scribe still holds the highest position on a card or they were outbid, they may move their scribe to an unoccupied space on a different province card. It should be noted that the player may move to a higher position on the same card by playing a bribery card. Once all the provinces have only one scribe on them, each player must pay the amount of their bid in gold to the reserve. The province card is then placed in front of the player, leaving the scribe on the province to show ownership. They then take the immediate bonuses that were placed on the province. The next phase is the purchase and construction phase. In this phase, players can make purchases beginning with the first player. Players can purchase favor cards, farmers and stones in this order. The cost for these is shown on the Order and Cost to purchase section of the board. Up to 4 favor cards can be purchased, this is determined by the highest number of favor symbols on a single province controlled by the player. Farmers may be purchased to be placed in open fields in the player’s province. However there must be a spot to place them in one of the player’s provinces. Stones can be purchased and are immediately placed in one of the player’s provinces. As soon as a third stone is placed in a single province, the player replaces the 3 stones with a pyramid. If a single pyramid is already there, it’s replaced with a double pyramid. Free Farmer and Architect cards may be played during this phase to place a farmer for free, or to build a pyramid using only 2 stones. The third phase is the offerings to Amun-Re. In this phase, players secretly select one or more of their gold cards as an offering. They will hold them out and cover them with their hand to show they are finished. Once all players have committed to an offering, the cards are revealed. Players can offer gold cards as well as a theft card, which will allow the player to steal 3 gold from the supply. They can also offer an offering adjustment card which will allow the player to either increase or decrease the total value of the offering by 3. Each player totals up their offering, reducing a player’s offering by 3 if they offered a theft card. Each personal offering is added with all the other players to get a total. Any player with a Offering Adjustment card now declares their decision to either increase or decrease. Once the collective offering is determined, the corresponding offering tile is placed on the Nile delta of the board. Players that played a theft card return it to their hand and collect 3 gold from the supply. At this point, the player that offered the most gold is given 3 rewards as well as the first player marker. This can be favor cards, stones or farmers in any combination as long as they add up to 3. The second highest offering gets 2 rewards and the remaining players only get 1 reward. It should be noted that a player that played a theft card does not receive a reward. The final phase is the harvest and income phase. In this phase, players earn gold for gold mines, caravans and farms. Each province that has a gold mine earns gold equal to the number shown for the gold mine. Caravans earn gold equal to the number above the camel icon in the player’s province. However they only earn gold if the offering tile shows a camel on it. Farms earn gold for each farmer in a player’s province. Each farmer earns equal to the amount of gold shown on the current offering tile. A player may also play a Big Harvest card to earn 1 extra gold per farmer in 1 of their provinces. A player also has the option to play a Treasury card which allows them to gain 8 gold for one of their provinces instead of the amount they would have collected. Once these 4 phases have been completed, the round is over. If this is the 1st or 2nd round of an age, then a new round begins like normal. If instead it’s the end of the 3rd round of the age of the Old Kingdom, then the province deck should be empty at this time. Victory points are scored before beginning the age of the New Kingdom. We will discuss scoring in just a moment. At the end of the round it’s the end of the Old Kingdom, then players must remove all the scribes and farmers from their provinces and return farmers to the supply. All the province cards that were played are shuffled to form a new province deck which is then placed on the board. Pyramids and stones are not removed. If instead, it’s the end of the New Kingdom, then on top of regular scoring, players earn victory points for having the most gold. Once the New Kingdom is over, then so is the game. Final scoring occurs. Scoring for both ages is as follows. Players gain points for each of their temples, for pyramids they possess, for each pyramid in their province with the fewest pyramids in it, for having the most pyramids on one of the sides of the Nile and for each yellow favor card. The player’s scoring marker is then moved along the scoring track a number of spaces equal to the victory points earned. Once final scoring for the New Kingdom is over, the player with the most victory points is the winner. This is a really lovely looking game. The board really gives you that feel of Ancient Egypt with all the really great artwork. It’s also really great that there are spots on the board for all the different aspects of the game, such as the decks, farmers and pyramids. Speaking of the decks, the different card types are really nicely done as well. I like how easy they are to understand. The artwork is a little basic but it helps convey the card’s purpose without giving you too much information. The game also comes with some wooden pieces. There are victory point markers for keeping up with your score on the scoring track as well as the scribe pawns. Let me just say, these scribe pawns are absolutely hilarious. When I first saw them, I immediately thought of the old Bangle’s song, “Walk Like an Egyptian”. Now I’ve got the song playing in my head again. Each pawn and marker is brightly colored and looks great. There are also some really cool looking pyramids and stones included with the game. I really love the look of these. They really convey the Egyptian feel. Finally the game comes with some cardboard tokens and tiles for the farmers and the offering tiles, as well as the first player marker. These are also a lot like the cards and don’t flood you with a lot of art and information. However, I really like the look of them and think they really fit in well with the game. Overall, I really think the game fits the theme extremely well and you really get that Egyptian look. This is a really great looking game in my opinion. The rulebook for this game is actually quite nice. There are lots of pictures and examples throughout the book. I will say that it does fold open more like a map however instead of an actual book. That could be to make room for the large board and components overview on the inside cover. All of the symbology on the board as well as the different phases of the game are covered in great detail. There is also a really nice rules overview, that when the book is opened, appears on the other side of the board picture. I’m guessing that this was planned cause it’s really quite helpful. There are also some expert rules that I didn’t cover included in the book for putting a bit more difficulty to the game. The back cover of the book explains the different favor cards and how to count up victory points. I didn’t see anything that was difficult to understand or read. All total the book consists of only 6 pages, so reading over this won’t take long at all. Overall I think the rules are really well designed. I love Egypt and all things Egyptian. I love reading about it’s history and looking at all the beautiful pieces of artwork and architecture. It’s no wonder that this game really appeals to me on so many levels. As I’ve already mentioned, the game is beautiful and thematic. Each piece works well with each other. The game mixes area control with an economic bidding mechanic to form a well designed game. It has a good bit of player interaction as well as a bit of strategy too. One thing that I quite like about the game is that it’s broken up into 2 ages and this is where the scoring occurs. This gives the players a couple of rounds to get as many points as they can through a little strategic planning. Once that age is over everything but stones and pyramids get wiped out. Kind of like how ancient dynasties would be wiped out by later rulers, leaving only remnants of their stonework behind. I really feel that anyone that loves Egyptian history like I do, will really enjoy this game. Fans of Knizia’s work should find this game quite enjoyable as well. I highly recommend this one. Amun-Re is a game of economics and area control with an Egyptian theme. The game isn’t extremely long. Most game sessions last around an hour and 15 minutes or so. The components are really great. I especially like the artwork of the board and the pyramids. Thematically the game is really sound. I get a really nice sense of the different ages and how each dynasty builds off the older ones. The game is really enjoyable. I like that there’s just enough strategy in the game. It’s not too heavy. There’s a good bit of player interaction which I really enjoy as well. Fans of Reiner Knizia’s games, as well as players that like Egyptian history should really enjoy this one. I would highly recommend this one. It’s a whole lot of fun and fills my need for an Egyptian themed game. This is one that you should definitely take a look at if you’ve never played it before. Pharaoh would be proud. This entry was posted in Reviews and tagged amun, amun re, board, board games, card, card games, games, knizia, minstrel, re, reiner, reiner knizia, tasty, tasty minstrel games. Bookmark the permalink.